Hi all, today I have an interview with Nick Zachariasen on METAL WORLD! It's currently on DriveThru! I normally don't include game pitches here, but the METAL WORLD pitch is so rad, I had to! METAL WORLD takes the breadth of the heavy metal genre and throws it all into one game world. It doesn’t care how much sense something makes as long as it’s awesome. It has a demon-possessed lawman who rides a rocket-powered robot horse and carries a pair of 666-shooters. It has an undead ship made of the bones, sinews, and skin of the sailors it kills. Hell is a continent you can get guided tours of from the MegaDevil himself. The cherry on top? It has a volcano made of dragons, which shoots lava and more dragons when it erupts. The game system— including character building— are as loose as possible to allow your group to play the way you want. With that in mind, check out Nick's responses below! Tell me a little about METAL WORLD. What excites you about it? 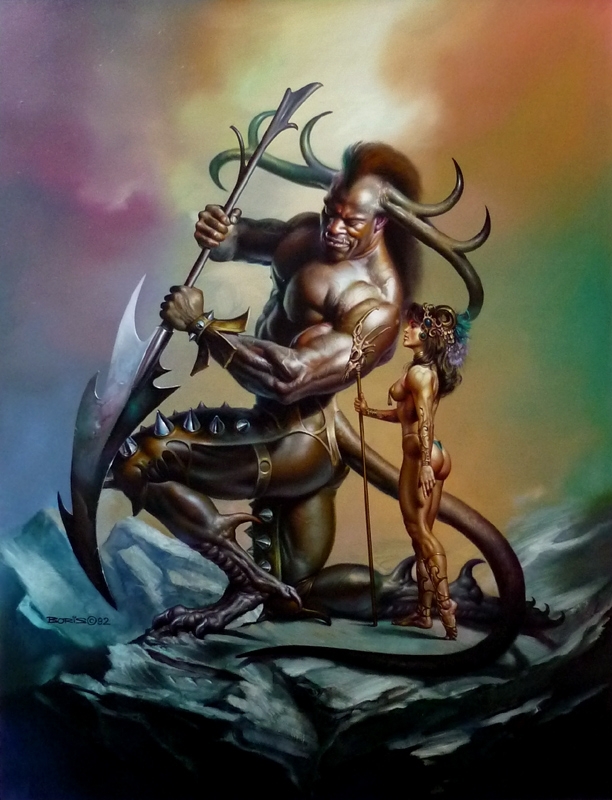 The germ for the idea that became METAL WORLD came about when I looked at the Boris Vallejo painting Kalevanpojat (above). There’s this giant half-man/half-dragon thing posing like he’s trying to impress this only nominally-dressed woman who could not possibly be interested any less. She has an expression as if to say “Yeah, buddy, just get down the mountain, already. Three of whatever you are have passed through in the last half hour. They’re probably at the tavern.” I imagined what kind of world that must be for such a fantastic sight to leave her completely unfazed. Fast forward to after the premiere of Metalocalypse and I finally come up with the vague idea of a world of heavy metal in all its breadth. Of course, a couple weeks later I learn about Brütal Legend, which was sort of what I’d conceived spiritually but for the most part not even close aesthetically, although I did draw some inspiration from it all the same. METAL WORLD ignores pesky things like so-called “continuity” or “travel time” unless it’s important for the overall story you’re telling with your group, and I think that’s what excites me most about METAL WORLD. I’m not aware of anything quite like it, where any play style your group could want is not just possible but encouraged so long as everyone’s on board, and the game actually mechanically encourages it with a rule set that’s just vague enough to be accommodating but specific enough to be playable while also having fun with its readers to keep from taking itself too seriously. What are the mechanics of METAL WORLD like and how do they relate to the theme? The mechanics try to be simple and stripped-down. You have five main stats, each named for a subgenre of heavy metal: Death (your health), Power (strength and “persuasion”), Prog (intelligence, perceptiveness, and actual persuasion), Speed (agility, reflexes, and overall coordination), and Thrash (combat ability). I kept it that simple because A) it keeps creation easy and B) on the eventual character sheet I can put each one at the point of a pentagram. The design philosophy is that instead of worrying about how far you can move in a round, exactly how long a round is, and that sort of thing you see some other games get bogged down with, METAL WORLD tries to focus in the in-game exploits of the characters and what they bring about in the world around them. It didn’t grow out of a wargame and god-of-your-choice help me if it grows into one. METAL WORLD’s main concern is giving people a setting that facilitates telling an interactive story with evocative imagery. That’s one reason I don’t have classes; they pigeon-hole characters into a predefined type without allowing for a player’s creativity to show through. You can have a band (METAL WORLD’s term for an adventuring party) containing traditional sword-and-sorcery fantasy characters like elves, humans, dwarves, and so forth alongside robots, cyborgs, Atlanteans, and METAL WORLD’s gnomes, which are a race of mad geneticists called ge-nomes— essentially, they’re a race of Bioshock-style Splicers. The environment contains everything from fantasy’s quasi-medieval environment to near-ish future tech and references galore to metal, its inspirations, and occasional random other things. You need complete freedom to be able to have that kind of spread in characters and environment, so METAL WORLD focuses a lot on group consensus as to the tone of the game, which means the Metal Lord (the GM) has very wide latitude of what to allow or to rein in if it proves unbalancing. Another important thing I think bears mentioning about that latitude is that the guiding metric of METAL WORLD is “as ______ as it needs to be.” Because everything worries more about the story than thinking about ensuring you have enough provisions for the trip or how much you can carry, let’s say an invading army approaches. Your story is about the epic battle that ensues like the battle of Helm’s Deep, so the band and NPCs have plenty of time to prepare defenses and have a grand old siege ahead of them. Now say you have a story in mind where the focus is more on evacuating those who can’t fight and making a stand to buy time. That same army leaving from the same place will take less time to get to the same destination. In METAL WORLD, space actually dilates or contracts depending on the needs of the narrative, though no character is ever aware of this— it’s just a cognitive blind spot created by reality itself. Similarly, a character can carry as much as (s)he reasonably could. Then you also have Metal points, which reflect the favor of The Gods™ like Fate Points in d6 Star Wars or bennies in Savage Worlds. They serve two purposes. First, they fuel magic use for those who know how to do that that as well as other effects, like maybe the powers of a magical item. More generally, though, they serve to allow characters to (usually) unconsciously generate special game effects depending on what they want to accomplish. You get them by doing particularly impressive things or just because the Metal Lord feels like it. What kind of player characters exist in the game, and what are they like? As I said before, you can make pretty much anything you can think of within reason and even perhaps a bit beyond. Your band can have an axe-wielding barbarian who rides a nightmare steed, a mad scientist who raises and otherwise experiments on the dead, a lizard man martial artist, a shroom-addled shaman who drives a wicked van with amazing scenery painted on its side, and a dwarf who’s replaced both of his hands with chainsaws. Mind you, all of these are among the sample characters I’ve created— the dwarf is named Angus Mac Chainsaw Hands. You truly are bounded only by your imagination and what the Metal Lord will allow. I haven’t statted minotaurs for use as PCs, for example, but if you want to play one, work with your group’s Metal Lord and figure out how to run one so it’s balanced with the rest of your group’s characters. Maybe you want to play something I haven’t even provided for yet at all. Make it up and work it out! Again, I want people to be able to create the most awesome things they can imagine so everyone can have fun with it. How do you handle topics like violence, sexual content, and so on in a game themed so wildly and intensely? bviously, violence is going to be present given that heavy metal isn’t exactly known for diplomacy over tea and crumpets. I mean, Hell is a continent you can physically go to and get a guided tour of, possibly by the MegaDevil himself. As far as sexual content, I do make a note about that in the introduction when I mention the traditional scantily-clad women you’d see in the artwork of Frank Frazetta, Boris Vallejo & Julie Bell, and other fantasy staples who inspired much of METAL WORLD’s aesthetic. I tell people to play it up to their group’s taste. This game tries to encompass the breadth of metal in its entirety. Some of that will involve mature-audience content and if you end up playing those kind of things up to the point where they become ridiculous, that’s totally fine if you’re enjoying yourselves. As you say, METAL WORLD is indeed wild and intense and I feel the form that takes should be subjective, determined by what you want out of it. It’s like how if you’re listening to metal and you want something dark and brooding you listen to doom metal while if you want something that fills you with a sort of positive energy, you’d listen to power metal. It’s clay in your hands. If you want to make that clay look like something you might not want your parents to see, what’s important is that it’s what you want, not what somebody else wants. When you get right down to it, that’s one of the classic themes of metal as a genre. What is one of your favorite moments from playtesting or designing METAL WORLD so far, and why? I honestly haven’t gotten to playtest METAL WORLD nearly as much as I’d like. I mean, having to work a full-time job will necessarily do that, especially when you have a family. That’s why I hope people run through some sessions on their own (via downloading METAL WORLD: The Rough Cut) and give me feedback so I know what makes sense to people who don’t already know what it’s supposed to mean. That said, I guess I have a few— deviating from your question just a bit— favorite design moments. The first is when I was writing about skills. I mentioned meteorology and added a footnote (the work as a whole is peppered with them throughout as asides, whether for comedy or to clarify without disrupting flow) that the Meteorology skill also teaches you about space because that’s where meteors are. This game is at least 20% puns and that’s probably my worst/best. The one with the best result as far as the overall work is how I added a chapter between the world (the fourth) and the creatures (then the fifth) so that I could have Chapter 666: The Number of the Bestiary. That chapter lists some adventure hooks and an example of play, which I think it really needed. I think the ge-nomes are one of my most clever ideas, having come to me as one of those thoughts that pops into your head about 15 seconds or so after your head hits your pillow at night. That said, though, I am aware of a moment from a friend of mine running a playtest session. Someone commented that METAL WORLD “reads like it was written by a madman with a law degree.” I don’t know what this person’s clue was, but apparently it caused “tear-inducing laughter” when my friend informed this person that it reads that way because it was written by a madman with a law degree! The METAL WORLD logo concept rough. Thanks so much to Nick for the interview! 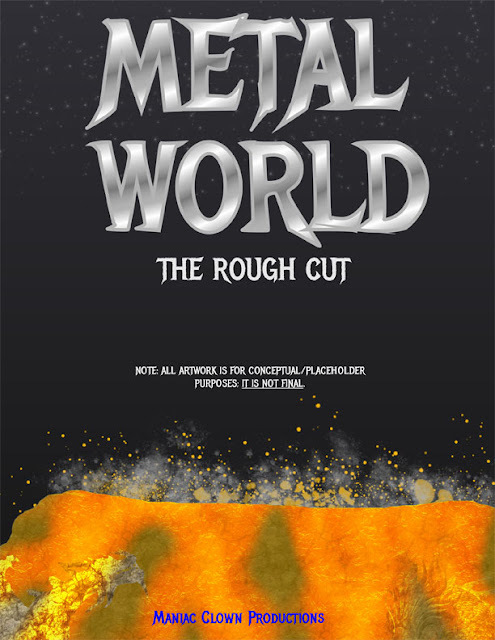 I hope you all enjoyed the interview and that you'll check out METAL WORLD on DriveThruRPG pay-what-you-want!